My client for this 8 hour session was Dave, a fanatical ‘Fly Man’ who has achieved some impressive catches of trout on from the rivers and reservoirs in around his Oxfordshire base. Therefore, the sea was, in comparison, something completely different and very much ‘alien’ to him in many respects. In my experience, fly fisherman make excellent bass lure anglers for many reasons: Firstly, the ‘match the hatch’ concept is certainly applicable to both disciplines – very much so in fly fishing of course. And bass will more often than not be hunting for certain items or being for very opportunistic. 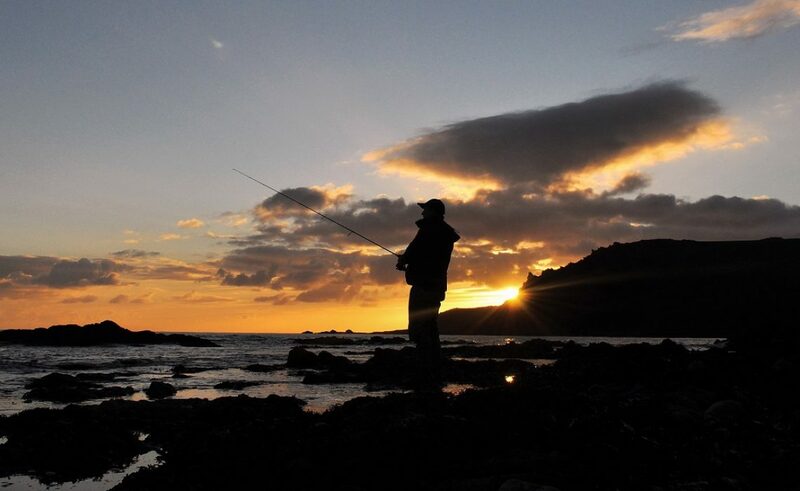 Therefore, nowing how to choose the correct lure to, for example, mimic prey items being hammered by mackerel or gobies swimming in the vicinity of rock pools is a very useful attribute to have. Secondly, knowing instinctively how and when to keep a low profile in around the river bank (or shoreline in our case) can be critical. Thirdly, the ability to ensure that the fly/lure/imitation is behaving/swimming as it should, in the most natural way possible is a skill that is most definitely transferable. Last but not least, playing and landing a powerful predatory fish on very light gear is something that can easily be ‘messed up’ especially when you add in sharp rocks, swell, waves, tide and strong winds to the equation. Ultimately, understanding when and how to apply the correct amount of pressure on a hooked fish is paramount to actually getting it safely onto the rocks or beach. Describing the set up (comprising a Savage Gear Salt CCS 7-28g lure rod, Mitchell Mag Pro Extreme 500 reel, 20lb braid, 15lb fluorocarbon with a small ‘popping’ surface lure attached) I proceeded to talk Dave through the correct way of ‘working’ the lure – initially casting well away from the ‘hot-spot’ so that I could also demonstrate the action/retrieve. I then handed him the rod and pointed out a finger of rock that ran parallel our stance and just below the surface some 25m out. We were fishing from a headland where the tide was starting to push strongly from right to left therefore, I asked Dave to cast the lure up-tide slightly (at 2 o’clock to our position) in order to ensure the lure was moving naturally with the tide/waves and not against it/them – all looked good. All was not well however… Dave was really struggling to ‘hit the spot’ with his casting style, as he was using his arms and not the rod to ‘flick’ the lure seawards. I can only assume that when you’re used to continually casting a fly rod, then utilising the power and finesse of a modern lure rod to propel a 13g lure is something quite different? But with a couple of adjustments and a real emphasis on pulling the left hand into his chest whilst bringing the rod over his right shoulder, and then feeling for that slight weight on the rod tip (the lure) before releasing the line with his index finger he was in business – just in time for the best part of the tide on this particular mark. Big splash and he’s in! With Dave now consistently placing and working the lure perfectly I was confident that something would happen – especially considering the amount of bait fish that were about. Ten or so casts later and a huge splash on the surface, in the exact area that I’d expected a fish to hit it (just behind the finger of rock) a very decent and angry bass was doing its best to shake the trebles. 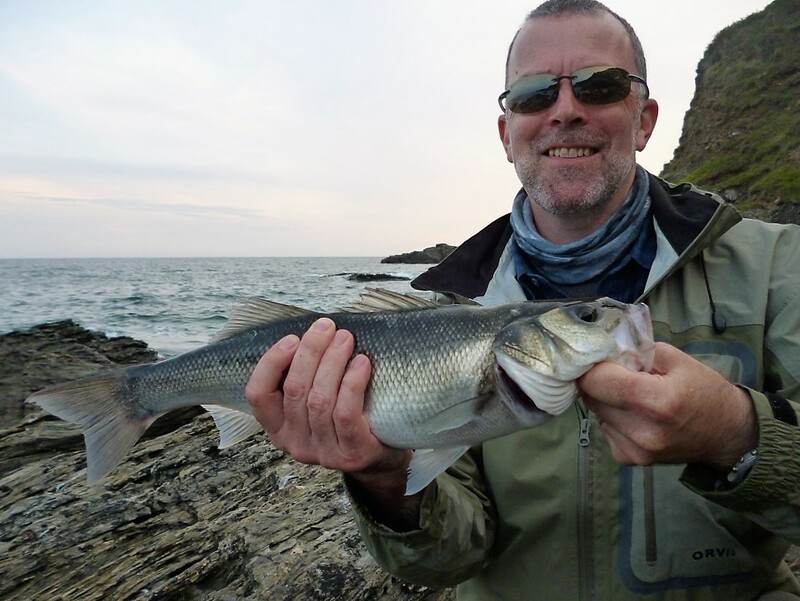 As expected, Dave did a fantastic job of ‘guiding’ the bass well away from the rock and was in complete control as the 2¾lb bass neared the ledge to our left and my waiting net – in she went first time! I looked up at a grinning Dave and shook his hand – a lovely moment. Following a couple of photographs, with the water so amazingly clear I grabbed the Go-Pro in order to shoot a short video of the bass being returned (see at the bottom of this post). It was as I looked up that I noticed a huge disturbance around 100m down tide as mackerel and more than likely bass tore into a large shoal of bait fish – was this going to be a bumper session? Dave’s first ever bass caught on a surface lure in bright conditions. At close to 3lb, this was an excellent start to the session. The successful lure is new to the Savage Gear range. The 3D Minnow Pop Walker 80 weighs 14g and is 80mm in length. It also comes in a smaller 8g 66mm version. Within minutes of this triumph we needed to cross a narrow gully (set within the rock formation) as the tide was now creeping in rather quickly. A short walk around to the next mark then ensued. Dave was positively buzzing at this point and couldn’t wait to sample the next lesson in bass lure fishing – where and how to fish soft weedless/weightless lures. With small (50 – 70mm) bait fish being smashed on the surface, matching the hatch so to speak resulted in Dave’s first ever bass. With only 2 – 3ft of extremely clear water in front of us, covering a wonderful selection of now submerged rockpools and small boulders, subtlety and natural presentation was called for. With Dave being new to saltwater lure fishing, on our way to the next area I’d chosen, I stopped at a large rock pool higher up the shoreline in order to demonstrate how tiny movements to the rod tip are translated to various patterns of these very versatile lures – something Dave found very useful. A nice bit of swell rolled through just as I taking this photograph of Dave, hard at it, with a surface lure. For a solid hour we kept low as we slowly moved along the shoreline – staying well back whilst casting into the deeper areas of the reef whilst watching large mullet occasionally swim within centimetres of us – a fly rod quite possibly being very useful in this scenario! Before long, and as the sun began to drop in the sky it was time to move off of our little island, that was now surrounded by 18″ – 2ft of water. The next mark is a tiny cove facing south-west, where weed (and food) naturally collects in rougher conditions. Moreover, when the rougher seas subside, the rotting weed is a magnet for mullet – and where there are mullet feeding on maggots and flies there will be bass. In addition to the cove, just a few yards away is a lovely comfortable platform of rock situated in a way whereby you can fire out various lures out into quite a fierce tide, running over a flat-ish expanse of rock around 10 – 15ft down. What I’ve found is that bass can be caught in and around some larger exposed (dry) rocks that are present here in the final 2 hours leading up to high water. They then appear to venture into the cove over the actual high tide period. And with dusk coinciding with high tide, I was confident that we’d see some more bass action. With a lot of bait fish around it seemed very plausible that the bass were ‘tuned’ into attacking items primarily on the surface therefore, onto the lure clip went the 3D Minnow Pop Walker again. Literally within minutes Dave was in again as a bass came up from the depths and completely nailed his lure in a similar way to a Great White attacking a poor seal! Dave’s second bass, which although smaller, signalled the start of a hectic evening! As some cloud cover approached, the amount of swirls in and around the surface lure began to surprisingly decrease therefore, a change of tactics was required in the form of a shallow diving minnow. One of my favourite lures is the Ryobi Trapper Minnow, which is exactly the same lure as the Hokkaido Metsuki I was using (with pleasing results) last season – the only difference being that they are cheaper! You can purchase three of them for £12 from the excellent Osborne & Cragg tackleshop in Plymouth. Ryobi Trapper Minnow 125F (Floating) 125mm and weighing 12g – the colour is the Tennesse Shad pattern. The lure ‘swims’ at a depth of around 1 – 2ft below the surface. Now admittedly, these lures wouldn’t be my first choice if I was attempting to hit long distances into a strong headwind, but when only short (up to 25m) casts are required the action on these fantastic lures more than compensates for any wind penetrating prowess. With Dave now aiming the lure between two small promontories of rock and retrieving it within close proximity to a recently submerged rock (that has seen countless bass hit a lure from behind it) it was only after two casts that he got hit really close to his stance (maybe 3m out). When bass find themselves hooked this close to you they really do send a ‘jolt’ through the rod and your arm! Dave did everything right – not panicking at all despite the bass’s very clear intention to pull the line over the rock and within a minute or so he was holding a beautiful 52cm (around 3lb) stunner. As the cloud cover increased, a switch to a sub-surface lure resulted in this plump bass that hit the lure with real vigour very close to our stance. A couple of casts later and this time another bass hit Dave’s lure after only a few turns of the reel. This smaller one was travelling down in the flow of the tide, at a range of about 20 – 25m from us and once again, put up a tremendous scrap. Indeed, Dave commented a number of times how impressed he was with their fighting capabilities in relation to their size. A quick shot with the guide! This 2lb bass hit the lure at range out in the main current. Leave the best until last! In near darkness, I instructed him to make a cast across the mouth of the cove or inlet – the type of which that on many occasions I have experienced bass moving out of the main flow of the current to explore. First cast, a nice steady retrieve with one or two slight twitches… nothing. An adjustment was required… I asked Dave to move back down the line of rocks towards me so that he could effectively cast the Ryobi Trapper Lure parallel to the main body of rocks – basically giving any bass present a different view of our sandeel/bait fish imitation. A nice gentle cast and after a few seconds we heard the ‘plop’ of the lure, as by now we couldn’t see it landing on the surface in the gloomy twilight . After 3 or 4 turns of the reel the rod was slammed around very hard following another positive take as the bass took a couple of feet of line from the tighten drag – this was in anticipation of having to manoeuvre a hooked fish through quite a narrow gap in the rocks. My lucky cove had done it again! Importantly, we had specifically left it well alone in order to allow the bass to move in and become ‘established’ so to speak. Once again, Dave did a brilliant job of neutralising any attempt by the fish to make good it’s escape, and following a moment where we both lost sight of it in our head-torch lights, the next time it thrashed on the surface my (thankfully) improving net skills were successfully deployed – phew! At 54cm, this 3¾lb bass was in mint condition and with a belly clearly filled to the brim with the small bait fish we had seen in the area. Dave’s 5th and largest bass of the 8 hour session taken in near darkness from a very remote, shallow (4 -5 ft) cove or inlet, over the HW period. It certainly looks well fed! At £4 per lure, these proven bass catchers clearly offer excellent value for money. I was really pleased for Dave. A really nice bloke, he had been on quite a sharp learning curve initially but his fly fishing experience had really come to the fore on a number of occasions – most notably his understanding and execution (for want if a better word) of how to work the lures and his ability to land all of the fish he’d hooked. As I write this blog post, Dave has just booked another session with me in mid-October. I look forward to guiding him again and we will most certainly fish along a different stretch of coastline, utilsing diffrent lure types, so that he can gain even more expertise – another 5 bass would also be very nice indeed! Previous Client Catches -Warming up nicely!